Created by Catherine Kerboull, this authentic French delicatessen was the unlikely result of a love for French cuisine, knitting and home interiors. If like Catherine, you’ve got an immoderate affection for the beauty of one’s country, its wealth of arts, its wonderful regions, its diversity and its way of life, then it’s only natural that gastronomy, French cuisine, traditions and expertise all form an integral part of your personal vocabulary. So, imagine having read an article about the knitting revival as the latest design trend, and then the very next day as you’re browsing the local market, you find yourself drooling over the saucisson stall. Then yes, the incongruous idea of knitting France’s well-loved saucissons might well just come into your head! That’s all well and good, but the next step involved putting the idea into practice: finding the right wool, the right netting, the right string and the right machines. Much knitting was required and the whole lot had to be brought together with one goal in mind: to create the incredible illusion of real life saucissons! Next, a name was needed, then there’s the sheep logo too, plus coming up with funny, French-inspired labels – basically, create a whole universe and a collection of charcuterie to go with it. The result? Charcuterie and cheeses that are 100% made in France! Foodie delights that don’t stain, won’t dry out or make you fat, plus they’ll keep forever. Deli products that are 100% vegan, organic, gluten-free and not a calorie in sight, made for all ages, genders, tastes and religions…. Perfect for a quirky, original gift, or for simply hanging up in your kitchen! Want to add a creative unique touch to your kitchen décor? Looking to make your friends laugh? Or simply want to offer a unique yet typically French gift to your foreign friends? 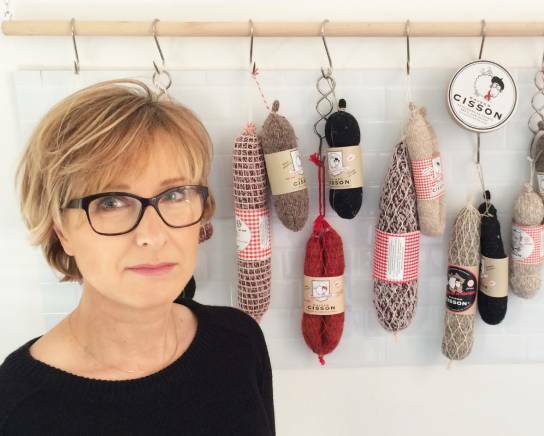 Then Maison Cisson’s knitted saucissons and cheeses 100% made in France are what you’re looking for! Our products are funny, podgy and above all they’re not perishable. They’re forever proud ambassadors of French culture and gastronomy. Vive la France and its wonderful charcuterie and cheese!